Sometimes, making your own products might not be cheaper, but they will almost always be healthier for you and your family. For my family, we didn’t have much choice in making the change from buying everything at the store and getting to the point where we could stop buying and start making most of what we need. For us, that meant finding as many cheaper options as well as all-natural options as well. This DIY hand soap is super easy to make and as far as a homemade hand soap goes, it’s my absolute favorite. The Cypress and White Fir scents blend so well together that I love having it in my home! Hand soap is one of those things that my family (and I’m sure yours too) goes through at an insanely quick rate. Think about how many times per day you wash your hands. 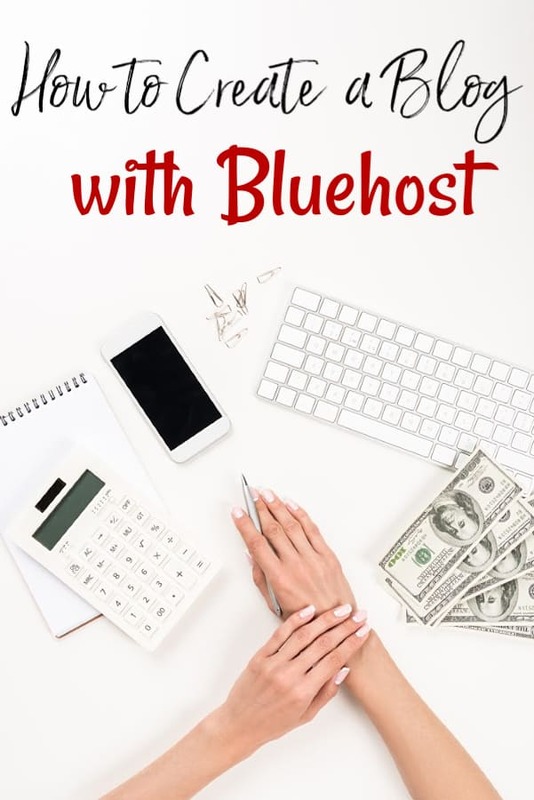 At $1.00 per bottle (give or take) in the stores, you could very easily chip away at your budget before you realized it. With a DIY hand soap though, you may pay more for the supplies needed up front, but overall, you’ll save more in the long run since those ingredients will last you quite a long while. This hand soap combines very few ingredients, but ones you can feel great about using. The woodsy scent is wonderful & everyone will enjoy it, not just the girls! The Castile soap moisturizes & the essential oils are an invigorating & happy blend that will leave you feeling refreshed! If, however, you’re looking for one that isn’t scented too heavily, our homemade hand soap recipe might be a better fit for you and your family. When you make this, don’t use a plastic storage container and instead, use either a mason jar or a dark colored lotion bottle. The essential oils in it will break down the plastic and you’ll end up with yucky stuff in your soap. For the essential oils, you can use any brand that you want as long as it is pure oil and isn’t cut with any carrier oils. I personally prefer NOW Foods brand or Plant Therapy oils. Both companies are high quality oils and are no different than the more expensive brands! 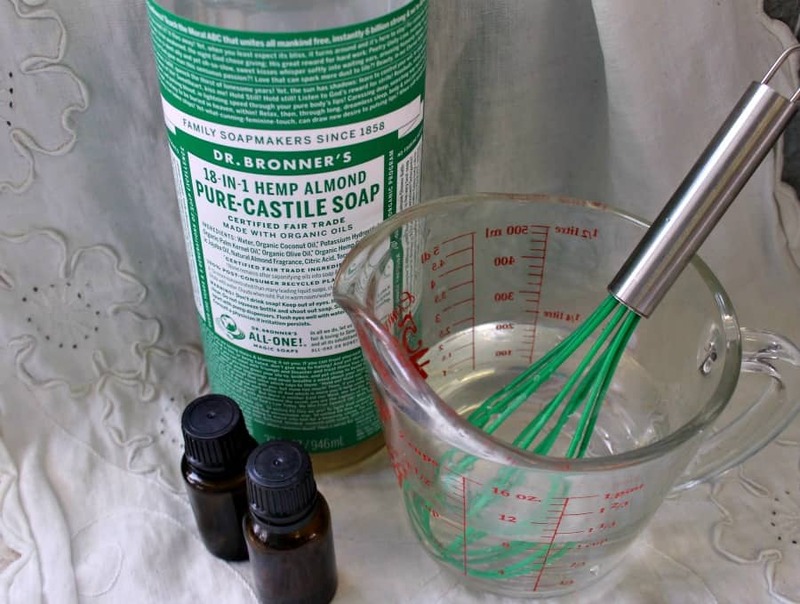 In a medium mixing bowl (or measuring cup like we used), combine the Castile soap and water. For this one, I prefer to use the almond scented Castile soap, but you can use unscented if you’d like. The almond scent gives it a nice, sweet scent that my family likes. Use a whisk and whisk until it froths up a bit. 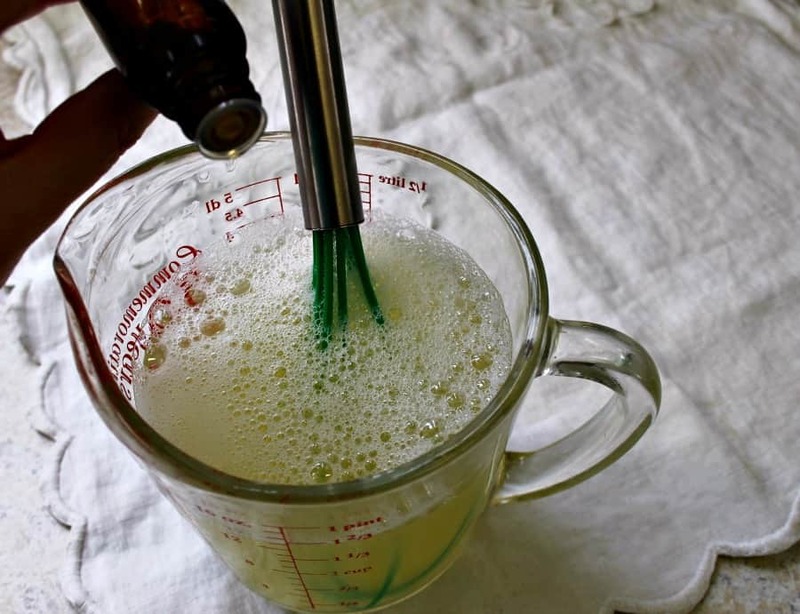 Add both essential oils and whisk again making sure that you get it all blended well. Pour into your container and add your soap pump! Because this froths up so much, it can be used as a homemade foaming hand soap if you have the correct pump needed. If you’re going to add a label to your soap jar, be sure that you cover the outside with some wide shipping tape. This will help protect it from getting wet as your soap gets used. 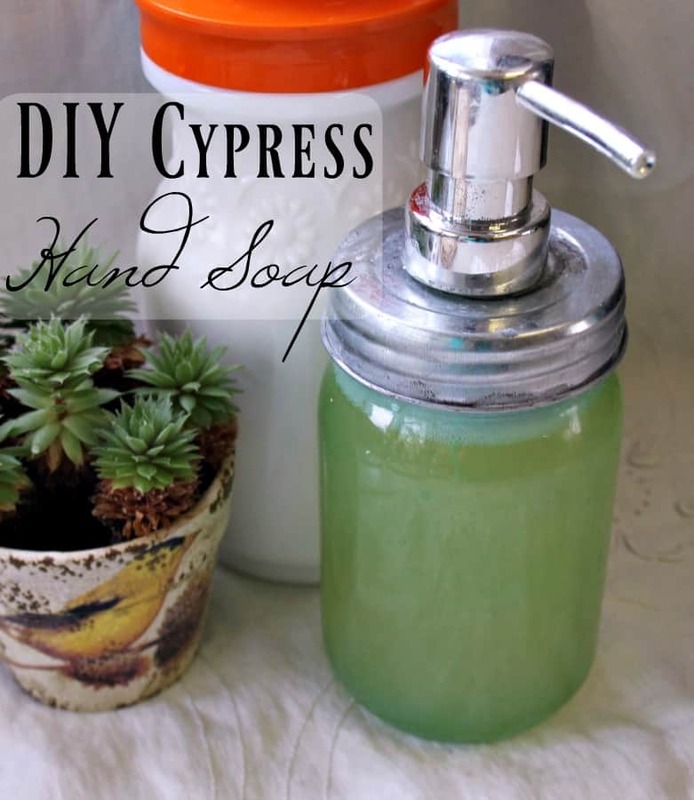 If after making your DIY Cypress hand soap, you find that your soap is too thin, you can thicken it by making a salt water solution. Add .5 oz regular table salt to 1.5oz warm distilled water and stir until it is dissolved. 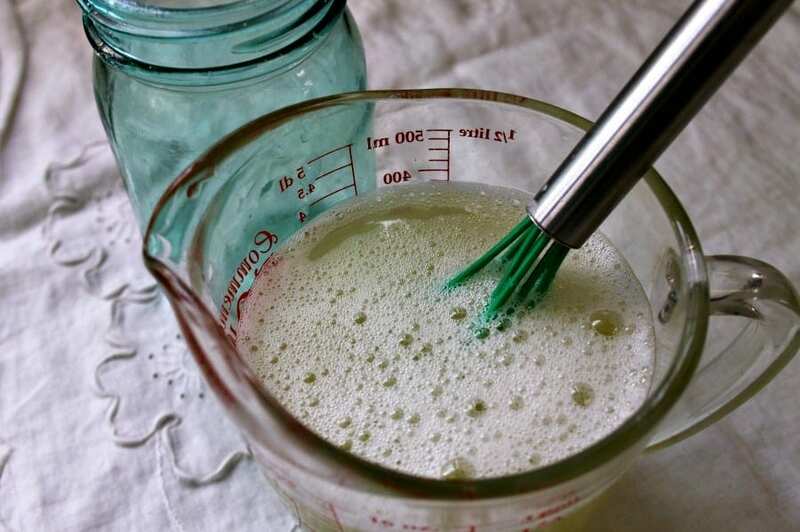 Then, in very small amounts (1 ml or less), add to your soap and stir. Continue adding the salt water solution to your soap until you’ve got the consistency that you want. To use, squirt just a bit onto your hands and wash like normal. A little goes a long way with this so you won’t need much. You will want to make sure that you shake the jar every so often to help combine any ingredients that may have separated.